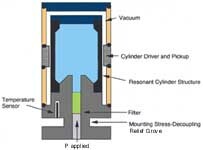 Resonant-cylinder sensors are strain-based, wherein a structure is caused to resonate at its natural frequency and this frequency is modulated as a function of the input parameter. The pressure sensor is the most common adaptation of the resonant principle, where a flexible metallic bellows is used to modulate the force applied to the resonant structure as a function of pressure. The resonant cylinder structure is caused to oscillate at its natural frequency where changes in the frequency of oscillation occur due to the pressure-induced hoop-and axial-strain. Recent advances in quartz fabrication technology have resulted in the fabrication of a new generation of Double Ended Tuning Fork (DETF) resonant structures that are being successfully applied in the fabrication of inertial grade miniature accelerometers. For the resonant-cylinder sensors, the structure must be driven into resonance by either electromagnetic or piezoelectric methods. required is small. Resonance is therefore, the frequency of motion at which maximum efficiency results for any structure. Modern quartz crystal wrist watches contain a single-ended-tuning fork assembly resonating at typically 32,768 Hertz as the time base for the watch circuitry. in the fabrication of the resonant structure results in a highly-stable and high-resolution measurement method. circuitry then counts the oscillator output over some defined time-averaging window. low. Alternatively, the frequency of the resonant structure can be measured utilizing a period measurement system to provide a much wider measurement bandwidth. Period measurement systems rely upon a second internal time base operating at a much higher frequency than the resonant structure to provide adequate period resolution. measurements, the longer the counting time period, the higher is the resolution of the system. It is not uncommon for resonant sensors to show 8 decades or more of signal resolution. sensors are provided with inlet filters to prevent the ingress of particulate matter. In metallic cylinder structures, the thermoelastic modulus results in a strong thermal-sensitivity dependence and these systems are most often thermally controlled to minimize thermal error. The resonant-cylinder device provides extreme resolution with excellent linearity but where a single degree of temperature change can result in error that is 10 to 100 times greater than the nonlinearity error.